This is a screenshot of the OmniSEC profile of dextran. We offer a set of broad Dextran standards for light scattering and triple detection. The run conditions are detailed in the table below. 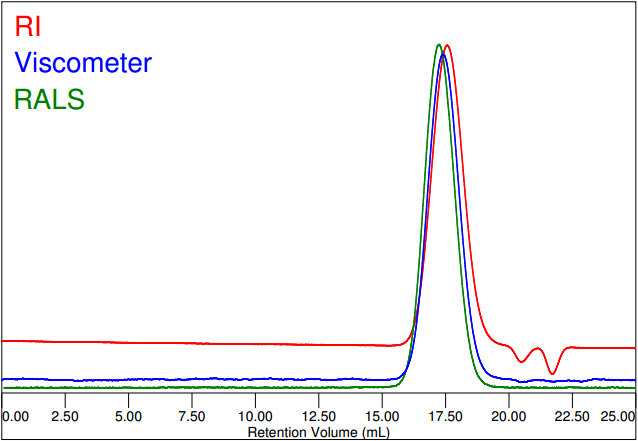 Chromatogram of Dextran: Refractive Index (RI), Viscosity, Right Angle Light Scattering (RALS) signals versus elution volume. Dextran is a typical polysaccharide and chromatographs very well. This dextran has a broad polydispersity index PDI = Mw/Mn value of 1.38. It is typically used as a system suitability sample for aqueous polymer applications, and often also a good choice for system calibration. Where can I find dn/dc? If you have any questions, please email me at ulf.nobbmann@malvern.com. Thanks!